Visit fabulous worlds with Plumeboom, the magnificent traveler. Touch down in the country of Aboo, settled by hard-working wormlings. Day after day, they quarry Magic Crystals that can be converted into many possible items. Recently, the wormlings have faced a real disaster. Help them battle Crowbreak, the wizard, and Cornix, the mad scientist who have invented the Weapon of Darkness. 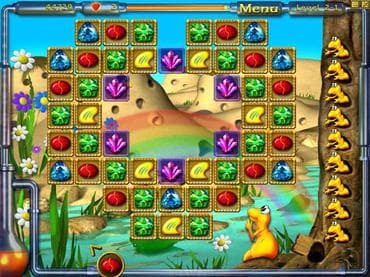 Don't let the Magic Crystals fall into the wrong hands in this illuminated Match 3 puzzle game. Free Game Features: - Family friendly puzzle game; - Amazing graphics and relaxing soundtrack; - Unique power-ups; - Save / Load game option; - Game statistics; - Free full version game without any limitations. If you have questions about A-b-o-o game, please contact us using this form.